Father Minn is missionary priest with The Korean Missionary Society (KMS). KMS currently has 74 priests ministering to areas around the globe in need of priests. 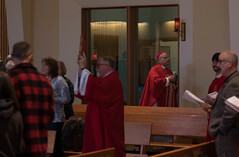 Alaska is the only state in the United States where missionaries serve, there are currently three other KMS priests working in parishes in the Archdiocese of Anchorage. Other countries served by KMS priests include Mexico, Cambodia, Mozambique, Papua New Guinea, and the Philippines. Father Minn was ordained a priest in 2002, but he didn’t initially set out to be a priest. After high school he went to college to study chemistry. While in college he worked at his local parish teaching Sunday School. Being a Sunday school teacher, he decided to attend daily Mass every morning at 6 AM. “At first, I went to Church for the kids, but later on I began going to Church for myself,” Father Minn said. It was the daily participation in Mass that attracted him to the priesthood. Following his graduation with a degree in chemistry, Father Minn decided to go in to the seminary. Following his ordination, Father Minn served in Calcutta, India for a year to gain pastoral experience. In Calcutta, he worked alongside the Sisters of Charity and ministered to the many volunteers working there. It was in Calcutta where Father Minn, who already spoke Korean, English and Italian, learned Spanish. He shared that many of the volunteers in the region came from Spain. Though most understood Italian, he wanted to minister to the people in their language. Before the conclusion of his year in Calcutta he could celebrate Mass and hear confessions in Spanish. When Father Minn returned to Seoul, he worked primarily in the social pastoral field, working for Non-Governmental Organizations (NGOs) in the areas of international development and human rights. Though the work he was doing with the NGOs was important, as a priest he said, “I was missing the parish life.” Father Minn worked for nine years in the social pastoral arena and after a six-month sabbatical asked his bishop for permission to join KMS. After he was accepted into the society he completed training as a missionary priest. Last May Father Minn visited Alaska for the first time and decided that Southeast Alaska and the Diocese of Juneau was where he was needed. During his initial trip he visited Juneau, Ketchikan and Prince of Wales. Despite wanting to begin his new ministry in the Diocese of Juneau right away, the process of receiving his visa took longer than he expected. While awaiting clearance to work in the United States, Fr. Minn remembered how one parishioner in Ketchikan thanked him for considering the Diocese of Juneau and told him how she and fellow parishioners had been praying for more vocations and how his willingness to serve in southeast was God answering their prayers. It was this conversation that kept him eager to return to the diocese. 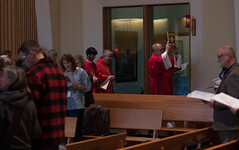 Father Minn arrived in Juneau at the end of March, almost a year after his first visit, and is currently assigned to St. Paul the Apostle parish in the capital city. In his first month he has served during the Holy Week celebrations and has enjoyed working in the parish and meeting the people. He shared that though he is a missionary priest, he isn’t here for a “missionary experience” but to work and lead as a missionary.